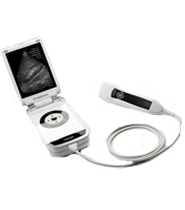 The GE VScan is a pocket-sized, portable ultrasound that’s designed to transform the way physicians see their patients. At the touch of a button, physicians will be able to acquire real-time, black-and-white anatomic and color-coded blood flow images, immediately and non-invasively.The GE VScan portable ultrasound will be able to travel with physicians from patient to patient, whether in a primary, critical, or specialty care clinical environment. Furthermore, to start up this ultrasound, physicians simply need to flip it open; features such as a one-hand user interface and presets for common applications ensure quick and efficient applications. Originally marketed as a cardiac “visualization tool”, physicians started using the GE Vscan portable ultrasound in a variety of other situations. It was originally misunderstood by many, who considered ultrasound only for full diagnostic use and measurements, not just a quick-look, bedside ultrasound machine. But as the market has changed and more physicians start using ultrasound at bedside (point-of-care), the Vscan quickly became a great choice for introducing ultrasound in the emergency department and primary care offices.The Vscan ultrasound unit is a unique product for this market and has become more popular as physicians discover its usefulness.